Dr. Oku Ampofo (1908-1998) of Mampong, Ghana, lived in Edinburgh from 1932 to 1940, and became the first Ghanaian to receive a government scholarship to study Medicine (Ofori, 2018). He began at the University of Edinburgh in 1933 and attended the night school of Edinburgh School of Art, studying under sculptor Norman Forest (Labi, 2013). The negative aspects of studying medicine such as pain and illness, meant that he focused more on his artistic practice, which almost lost him his scholarship (July, 1987). After his return to Ghana in 1940, he had both an art studio and clinic where he began practicing as a doctor, but moved into the field of herbal medicine due to his own positive experiences with it. After opening an outpatient centre in the 60s, his work was noticed by the first prime minister and president of Ghana, Dr. Kwame Nkrumah, who sponsored him to study herbal medicine further in China (Bremfi, 2017). Upon returning, he founded the Centre for Scientific Research Into Plant Medicine in 1975, officially recognised by the World Health Organisation 10 years later, which was a first in Africa (Bremfi, 2017). His ground-breaking studies in plant medicine led to over 300 plants being identified and certified as having medicinal properties for diseases such as sickle-cell anaemia, diabetes, arthritis, and even some forms of cancer (Ofori, 2018). When one of his influencers died, H.V Meyerowitz, it left Ampofo as the main art representative of the Gold Coast. This meant he scouted schools for talent and created relationships with other artists, leading him to form together a group of diverse artists called the Akwapim Six (July, 1987). He expanded his private collection of works in the hope of creating a permanent collection or archive of the best contemporary work being made in the country (July, 1987). This led to revolutionary exhibition in Accra entitled ‘New African Art’. 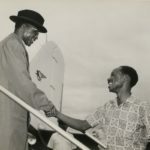 The British Council helped Ampofo and his collaborators create the ‘Gold Coast Art Society’, which was later renamed to the Ghana Arts Council after independence [Trip Down Memory Lane Blog]. Ampofo also spoke of the importance of valuing the art of the past as opposed to rejecting it and was passionate about African’s keeping their style of art traditional, describing many as being ‘spoiled’ by western influence. Continuing to produce African art while being surrounded by European styles was very conflicting for Ampofo. Describing the shock at his emotional reaction to viewing African sculpture in British museums, he said ‘it was as though the African had to go all the way to Europe to discover himself’ (MacClancy, 1997, p35). 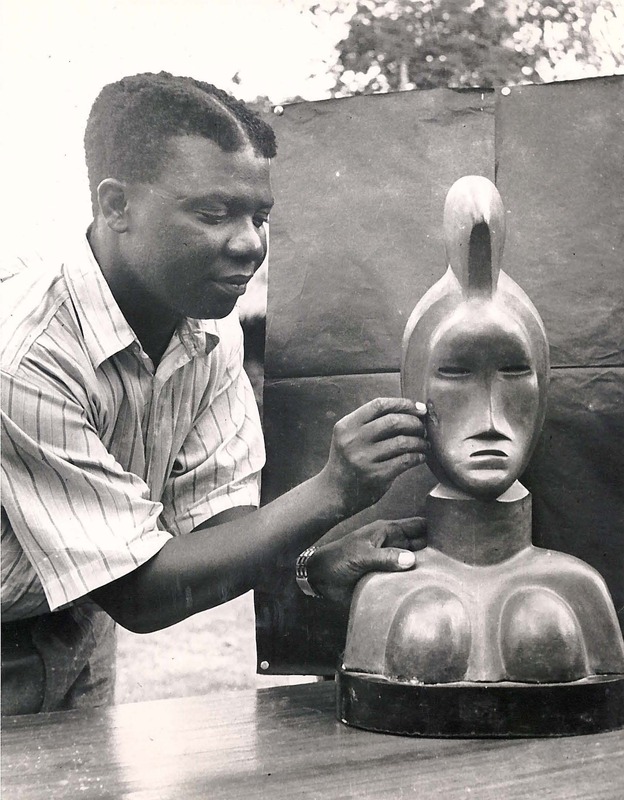 His sculptures featured traditional African materials, like ebony, and spoke of African culture. With realism being associated with European styles of art-making, pan-Africanism filtered into Ampofo’s artistic style with him stating that, ‘my work meant a step in the direction of a further development of a typical African identity’. The sculpture ‘Primordial Instinct’, of a woman symbolising motherhood and fertility, is an illustration of this (MacClancy, 1997, p37). Ampofo was deeply invested in the independence of Africa from Europe, not just in art but in all areas of African life. To Ampofo, art and politics were not separate entities, stating that ‘art had a function in the political struggle, because our artistic achievements showed that we are ready for political independence’ (MacClancy, 1997, p45). The pan-African ethos that the Ghanaian artists followed, had benefits for the country of Ghana ‘when political nationalism burst forth after the second world war, Nkrumah and other leaders were quick to employ aesthetic and artistic achievements for political advantage’. When independence was at the forefront of Ghanaian politics, the work of Ampofo and the Akwapim Six in upholding the African culture could be used as an example (July, 1987). 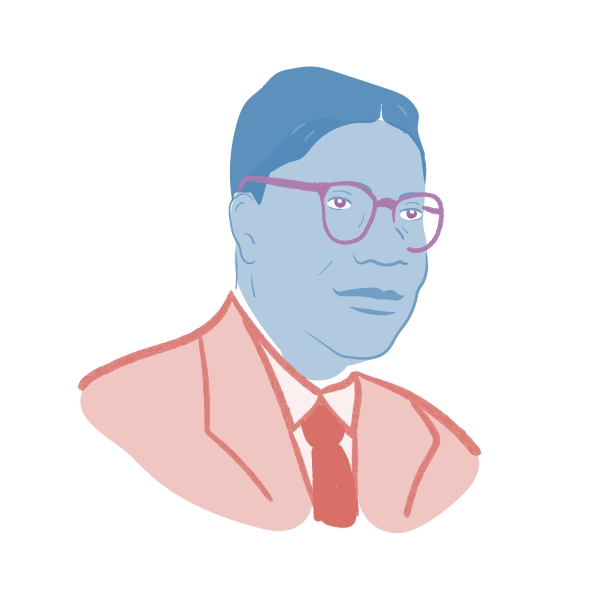 His work on the council to create the Institute of African Studies at the University of Ghana also speaks to this. Ampofo exhibited extensively across the world, including Senegal, Nigeria, England, United States, Israel, Brazil and Romania (Wikipedia). A sculpture of a crying woman ‘Woe to you, Mother Earth’ 1965 can be seen in the ‘Africa Room’ of the Kennedy Centre. MacClancy, J, 1997. Contesting Art: Art, Politics and Identity in the Modern World, Berg Publishers.